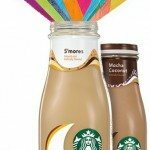 Bottled Frappuccino is sponsoring a summer giveaway contest: A trip to Los Angeles that includes airfare and hotel (3 nights) for two people. It’s super easy to enter. When you scroll to the bottom of the entry page, there’s a link to enter. Enter your email address and other contact information and you’ve entered. I skimmed the official rules and it looks like you must be over 18, and you can enter once per day. Click here for the link to enter this contest. It looks like there are a variety of prizes, but you must enter before July 31st to be eligible to win the grand prize. @Elly – Everybody needs a vacation! You do too! If I win, I’m not going to a concert in LA. It looks like there’s a rental car involved in the prize – I’m driving from LA county to Orange county, and will love every minute home with family. Please pick me to win!!! !